Mike's review on Oogave Key Lime was so good that I decided to take the full plunge into Oogave, and get a flavor I normally wouldn't... grapefruit. Grapefruit soda's don't really appeal to me, so take that into consideration during this review. I don't think that Mike particularly likes them either, so I just went ahead and decided to review it. I will say that Oogave gets points instantly from me for having a different bottle cap for each beverage. I know that seems stupid and small, but I like it when people change up their bottle caps for different flavors, even if (in this case) it's just the color. 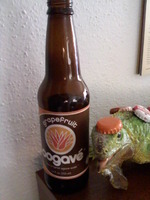 My other favorite thing about this bottle is the tiny Esteban's Seal of Approval on the bottom right of the main logo. I'd love to have a shirt with that on it for some reason. That'd be on one side of the shirt, with the Oogave logo on the other... instant gold. Upon opening the bottle I take a whiff, and notice some solid citrus scent, almost orange, but not quite. I guess that's sort of what a grapefruit is most like though... sort of an orange. Wow... I can honestly tell you the flavor surprised me a lot. My feeling toward most grapefruit sodas is marred by the fact that they are usually sour/bitter much like a normal grapefruit. This soda has zero bitterness in it, making it good for even someone that would hate grapefruit. Some might say "doesn't that mean if I love grapefruit, I'd hate the soda?" Not necessarily, you'd have your grapefruit, the flavor would just be more subtle. I would like for it to have a little more flavor though, as I have to search for it on occasion. There is little to no bite to this at all, as it's very smooth. It's also not overly carbonated, so those of you who don't like a lot of carbonation would enjoy this beverage. The more I drink, the more recognizable the grapefruit flavor becomes, which means I probably should have up-ended the bottle before enjoying. Still though, it's not an over powering flavor. Overall a good job by the people at Oogave.